9/4/2012 Layla Cox said: Throughout the series i just wanted to shake Katniss for being so naive about everything else but the capitol. So glad people have moved beyond Twilight. This series is so much better. the writing is tighter, characterization is great, and overall a great series to read. I listened to half of it and read half of it. Even though the book has been out for a while, I'm glad people are reading it. Course it helps that there is a movie out to intrigue those non-readers into trying the book too. In the North America of the future, the Hunger Games are too terrible to imagine and the price of winning too high. Just like in Shirley Jackson's The Lottery, no one wants to hold the winning ticket. 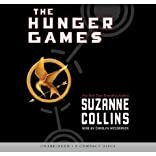 16-year-old Katniss Everdeen voluntarily takes her younger sister's place in a fight to the death... where there can only be one winner. 7/16/2011 Melanie Warren said: Recommended by my son...fabulous book!